Join the Future Timeline community! The Cascadia Subduction Zone is a 600 mile-long converging plate boundary stretching from northern California to southern British Columbia. The fault causes a major earthquake about once every 300 years. Compared to other fault lines, this is an unusually long return time – resulting in greater stress build-up and stronger subsequent earthquakes. The last major event (a so-called megathrust quake) took place in 1700 and was estimated to have had a magnitude of at least 9.0. Since then, the movement of the two plates has steadily built up pressure. In the first half of the 21st century, the fault exceeds the vast majority of previous time intervals in recorded history. * During this time, the plates finally slip, resulting in the single most devastating earthquake in United States history. *** It is centred on the state of Oregon, with a duration of several minutes, inflicting deadly damage to major population centres like Portland, Seattle, Olympia and even Vancouver and Victoria. Of course, many structures have been retrofitted and are able to withstand the earthquake, along with the majority of newer buildings. However, years of economic trouble, as well as a general inexperience of large earthquakes, have left many structures vulnerable. Bridges and highways collapse, while the ground in the Seattle bay area liquefies, dragging buildings underwater. Broken gas mains and power lines spark many fires. 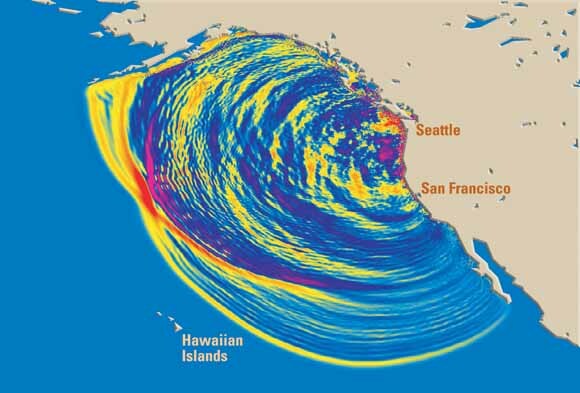 The quake generates massive tsunamis,* which inundate coastal communities from California to Alaska. These giant waves are sent racing across the Pacific, causing damage as far away as Hawaii and Japan. Millions are left without power, while emergency responders struggle to adapt to the scale of the disaster. The death toll quickly reaches into the thousands, while the financial cost exceeds $100 billion. Along with the similarly devastating southern California earthquake, this disaster pushes much of the American west coast toward financial ruin. 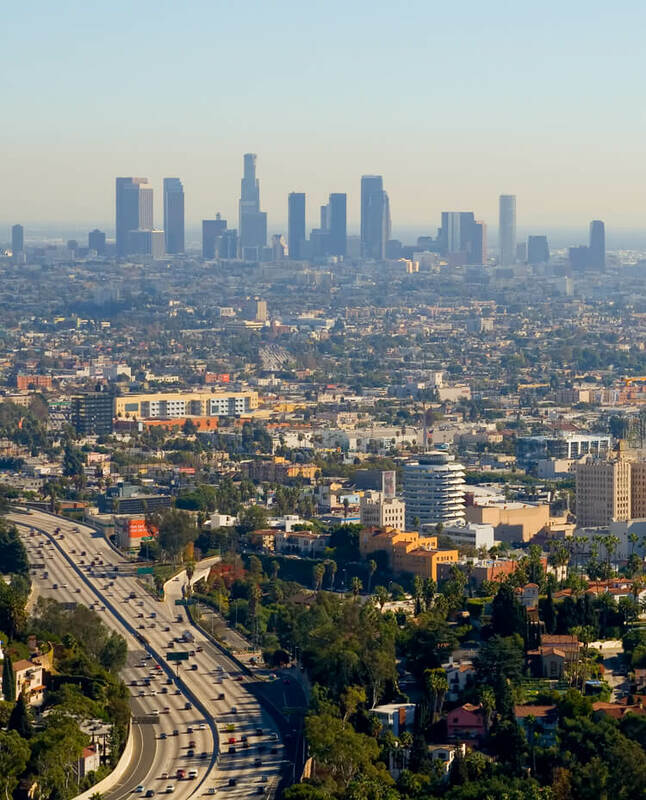 Experts had been warning for years that it wasn't a matter of "if" – but "when" a major earthquake would strike the Los Angeles basin. * This particular quake is of sufficient magnitude to cause tens of billions of dollars' worth of economic damage, with much loss of human life. Thousands of buildings are destroyed and there is widespread damage to roads, bridges and other infrastructure. 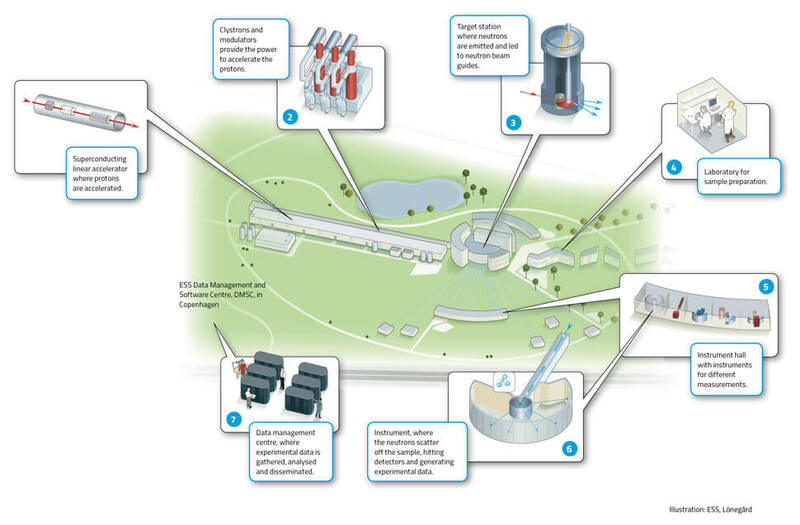 The European Spallation Source (ESS) is a multi-disciplinary research facility based on the world's most powerful neutron source. It is built in Lund, Sweden, with 17 European countries acting as partners in the construction and operation. A separate ESS Data Management and Software Centre (DMSC) is located in Copenhagen, Denmark. First neutrons are tested in the machine by 2019, with a user program starting in 2023, and construction of the entire facility complete by 2025. ESS is the world's next-generation neutron source, enabling scientists to see and understand basic atomic structures and forces at lengths and time scales unachievable with previous sources. The ESS uses "spallation" – a process in which fragments of material (spall) are ejected from a body due to impact or stress. The facility is composed of a linear accelerator in which protons are accelerated and collide with a rotating, helium-cooled tungsten target. By this process, intense pulses of neutrons are emitted and led through beamlines to experimental stations, where research is done on different materials. This helps in the discovery and development of new materials with applications in manufacturing, pharmaceutical drugs, aerospace, engines, plastics, energy, telecommunications, transportation, information technology and biotechnology. The ESS creates neutron beams up to 100 times brighter than any previous neutron source. * The facility is also designed to be carbon-neutral. 3D printing, also known as additive manufacturing (AM), is a process that allows physical objects to be printed in three dimensions, in contrast to traditional paper printers that work in two dimensions. Controlled by computer, successive layers of material are laid down, resulting in products created with a high degree of precision. This is usually achieved with powder heated by a laser, or held in place by spray-on adhesive. Additive manufacturing was first demonstrated in the 1980s. For many years, it was limited to specialist uses in product design, industrial prototyping, medical modelling and architecture. Like the earliest computers, these machines were bulky, expensive and slow; typically confined to large companies with massive R&D budgets. Driving its adoption were ongoing improvements in cost, speed and ease of use – helped by the entry and growth of more established printing vendors such as Canon, Epson and HP – along with continued advances in the range of "ink" materials. * By the end of this period (2019-2024), it is common for shoes and clothing to be purchased online and manufactured in the wearer's home within a matter of minutes. * This adds to the already huge variety of plastics and metals that can be used, in addition to glass, concrete and even food such as chocolate. Further into the future, 3D printing makes even greater strides. In schools, classroom use of this technology becomes widespread. * In hospitals, it is possible to manufacture human organs from scratch, eliminating the need for donors. * Large-format 3D printing is used more and more often in the construction of buildings and vehicles – even bases on the Moon. * By the late 21st century, entire skyscrapers can be printed from the ground up at nano-scale resolution. * The overall effect of 3D printing is more localisation of activity, a reduced need for transport, lower carbon emissions and less waste. From 2019 to 2020, the next major cellular wireless standard is rolled out, providing vastly improved data transfer rates. The 5G family of standards is a major leap from previous generations in terms of power and connectivity. While 4G bandwidth was typically measured in tens of megabits per second, with peak speeds of around 100Mbps, the new 5G networks achieve an order of magnitude improvement – several hundred megabits per second in real-world, less-than-ideal conditions, with peaks of multi-gigabits per second. Streaming of 4K and even higher resolutions, along with near-instant downloads of high-definition videos and other large files, becomes the norm. A key advantage of 5G is Ultra Reliable Low Latency Communications (URLLC) – i.e. reduced time to pass a message from sender to receiver – barely a millisecond of delay compared to approximately 70 ms on 4G networks. This is especially useful in multiplayer mobile gaming, factory robots, remote surgery (a.k.a. telesurgery), self-driving cars and other tasks demanding an instant response. 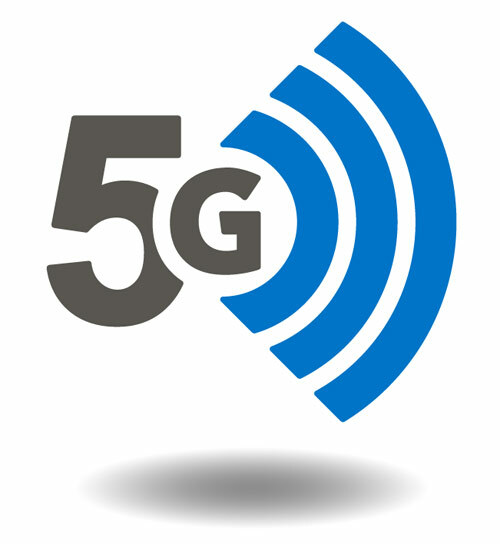 Another key feature is pervasive networks, which mean that a 5G user can be simultaneously connected to several wireless access technologies and seamlessly move between them, whether they are connected to 2.5G, 3G, 4G or 5G, Wi-Fi, WPAN or any other contemporary access technology. Multiple, concurrent data transfer paths are easily handled. Meanwhile, high-altitude stratospheric platform station (HAPS) systems using 5G can deliver high-speed Internet services to very large geographical areas. 5G is among the most significant technologies of the early 21st century. It marks the true birth of the Internet of Things (IoT), triggering an unprecedented explosion of "smart" devices with multi-trillion-dollar impacts. It ensures one unified global standard with full compatibility, no matter what brand or model. The first phase is completed by March 2019, to accommodate early commercial deployment for approximately 20 operators around the world, including all major U.S. carriers. The second phase is completed by March 2020. The 5G standard is followed by 6G in the 2030s, offering terabit speeds. After visiting Pluto and its moons in 2015, NASA's New Horizons probe began heading towards the Kuiper Belt – a remote ring of icy debris that surrounds our Solar System. The spacecraft performed a series of four manoeuvres in October and November 2015. These propulsions were the most distant trajectory correction ever performed by any space probe. New Horizons was now on course for a rendezvous with 2014 MU69, a Kuiper Belt object located a billion miles beyond Pluto. 2014 MU69 was discovered in June 2014 by the Hubble Space Telescope. Based on its brightness and distance, it was estimated to have a diameter of 30–45 km (20–30 mi), with an orbital period of 293 years, low inclination and low eccentricity. This unexcited orbit meant that it was a cold classical Kuiper Belt Object, unlikely to have undergone significant perturbations. Further observations in May and July 2015 greatly reduced the uncertainties in the orbit, making it a suitable target for New Horizons. The probe finally reached this object – nicknamed Ultima Thule – on 1st January 2019. * At 6.5 billion km from Earth, it was the most distant body to ever be encountered by a spacecraft. 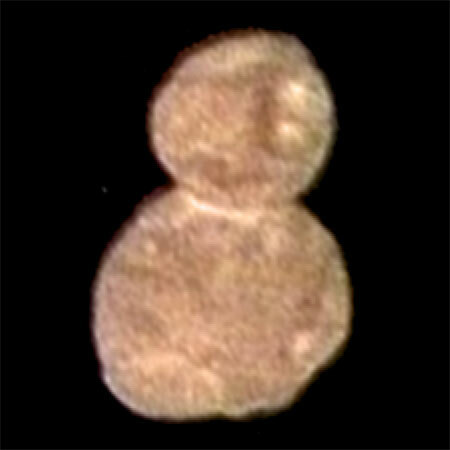 The close flyby revealed it to be slightly smaller than expected, with a striking and highly unusual "snowman" shape consisting of a top and bottom section fused together and a light reddish-brown colour. 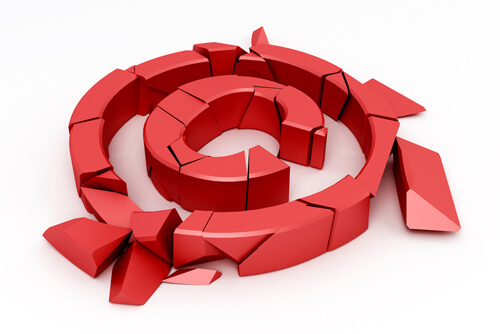 Up until 1998, US copyright law stood with all works published before 1923 in the public domain, all works between 1923 and 1977 holding a copyright for 75 years (assuming a renewal was made) and works published after 1977 holding a copyright dependent on the author's date of death. Examples of works now entering the public domain this year include the Pulitzer Prize-winning collection of poems, New Hampshire, by Robert Frost; the Noël Coward play, The Young Idea; and the film, The Ten Commandments, directed by Cecil B. DeMille. From mid-2014 to 2016, Brazil experienced a severe economic crisis. This became coupled with a political crisis that resulted in the impeachment of President Dilma Rousseff and in widespread dissatisfaction with the political system. In 2015, Brazil's gross domestic product (GDP) dropped by 3.9% due to falling wages, restrictions on credit and a rise in the basic interest rate. In 2016, it fell again, by 3.6%, with reductions across all sectors of the economy. This was the first time since 1931 that Brazil's GDP had fallen in two consecutive years. In 2017, a 1% rise in GDP for the first quarter of the year was reported; the first rise after eight consecutive falls over the previous two years. Minister of Finance Henrique Meirelles stated that the country had exited the "greatest recession of the century". However, economists warned that this growth characterised only the end of the "technical recession" and that it was still too early to declare the crisis over, given that unemployment remained high and much uncertainty persisted regarding the future of the country, especially in the aftermath of Brazil's political scandals. General elections were held in Brazil on 7th October 2018 to elect a new President, Vice President and the National Congress. Elections for state governors and vice governors, state legislative assemblies and the Legislative Chamber of the Federal District were also held. Jair Bolsonaro, Rio de Janeiro congressman and former army captain, won the first round of the presidential vote. On 28th October 2018, a run-off between him and Fernando Haddad, former São Paulo mayor, took place. With 55.1% of the popular vote, Bolsonaro was declared the winner. 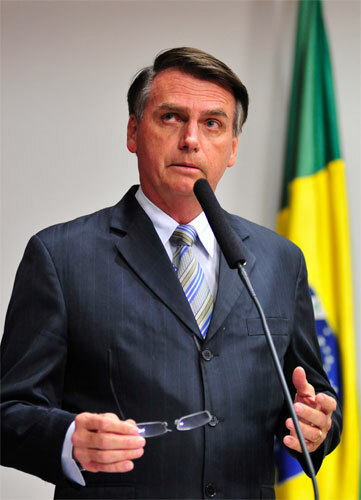 A polarising and controversial politician, Bolsonaro's views and comments – described as far-right and extremely conservative in nature – had drawn both praise and criticism. On 6th September 2018, while campaigning in the southeast of Brazil, he survived an assassination attempt when a 40-year-old man stabbed him, causing major blood loss. Later that month, hundreds of thousands of people across Brazil staged protests against Bolsonaro's candidacy. Throughout his political career, Bolsonaro had expressed his admiration for Brazil's military dictatorship, which ruled from 1964 to 1985, describing it as a "glorious" period in the country's history. He also repeatedly praised other Latin American dictatorships. Bolsonaro vowed to improve relations between the United States and Brazil, praising Donald Trump and his foreign policy. Regarding the State of Palestine (recognised by 137 U.N. members), he stated it was "not a country, so there should be no embassy here", adding "You don't negotiate with terrorists." Bolsonaro's son Eduardo indicated that Brazil should distance itself from Iran, sever ties with Nicolás Maduro's government in Venezuela and relocate Brazil's embassy in Israel to Jerusalem. Bolsonaro frequently provoked outrage for what many viewed as racist, homophobic and misogynistic remarks. In 2015, he argued that men and women should not receive equal salaries, because women get pregnant, adding that he believed the mandating of paid maternity leave harmed work productivity. During a public speech in 2017, he said that his first four children were male, but the fifth he produced was a daughter out of "a moment of weakness". Bolsonaro also stated that "I would be incapable of loving a gay son", adding that he would prefer any gay son of his "to die in an accident". He was described by The Advocate, an LGBT magazine, as "Brazil's biggest homophobe". Bolsonaro's election victory was seen as a crushing blow for the environment. He pledged to dramatically expand the available land for agriculture, energy, mining and other activities in the Amazon, as well as the vast and biologically rich savannas to the south. He promised to ban international NGOs such as Greenpeace and WWF from the country. He also came out strongly against lands reserved for indigenous tribes. Under his policies, from 2021 to 2030, accumulated emissions from clear-cutting the world's biggest rainforest would attain 13.12 gigatons of carbon dioxide equivalent (GtCO2e), making it all but impossible for Brazil to fulfil its commitments to the Paris Agreement. This quadrupling of deforestation would represent 20% of the "free" carbon budget remaining to achieve the 1.5° Celsius IPCC goal. Shortly before his inauguration, reports emerged on social media that more than 20 universities in Brazil had been subjected to invasions by military police, confiscation of teaching materials on ideological grounds, and the suppression of freedom of speech and expression – especially in relation to anti-fascist history and activism. These controversies would continue throughout his presidency. Bolsonaro's four-year term began on 1st January 2019. 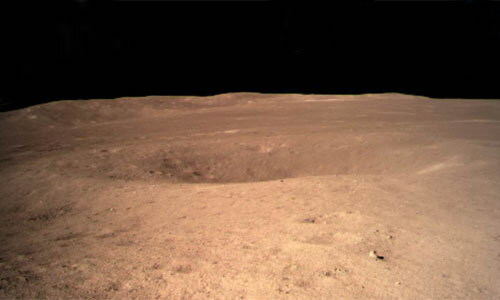 On 3rd January 2019, China made the first soft landing on the far side of the Moon with its Chang'e 4 probe. Named after the Chinese Moon goddess, Chang'e, this was a follow-up to Chang'e 3, a landing on the Moon's near side that occurred in December 2013. The landing site of Chang'e 4 was within a large crater called Von Kármán, about 180 km (110 mi) in diameter, in the South Pole-Aitken Basin. Like its predecessor, Chang'e 4 included a small rover with science instruments – a panoramic camera (PCAM), lunar ground-penetrating radar (LPR), visible and near-infrared imaging spectrometer (VNIS) and Advanced Small Analyser for Neutrals (ASAN). The VNIS would be used for identification of surface materials and atmospheric trace gases, while the ASAN would study the effects of solar wind and the process behind the formation of water. The rover's nominal operating time was three months, but after the experience with Chang'e 3 in 2013, the design was improved and Chinese engineers were hopeful it could last for "a few years". The lander also carried a 3 kg (6.6 lb) sealed "biosphere" with seeds and insect eggs to test whether flora and fauna could hatch and grow together in synergy on the lunar surface. The experiment included seeds of potatoes and Arabidopsis thaliana, as well as silkworm eggs. Environmental systems would keep the container hospitable and Earth-like, except for the low lunar gravity, with a miniature camera to monitor any growth. Chang'e 4 would be followed by additional Chang'e 5 and Chang'e 6 probes, aiming to collect at least 2 kg (4.4 lb) of lunar soil and rock samples and return them back to Earth, the first such effort since Russia's Luna 24 in 1976. These missions were intended to pave the way for a Chinese crewed landing. 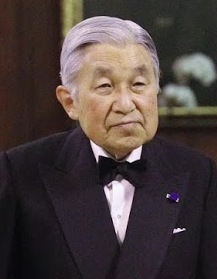 On 30th April 2019, Emperor Akihito of Japan abdicates his position, due to old age (85) and declining health. He is the first Japanese monarch to do so in over two centuries. This marks the end of the Heisei period (1989–2019) and precipitates numerous festivities leading up to the accession of his successor, the Crown Prince Naruhito. Akihito's younger son, Prince Akishino, becomes his brother's heir presumptive. Official farewell celebrations begin with a 30th Jubilee ceremony on 12th February. This is followed by a special ten-day block of Golden Week holidays lasting from 27th April to 6th May. The Enthronement Ceremony takes place on 22nd October, marking the end of the transition period, which is an extra public holiday. An abdication within the Japanese Imperial Family had not occurred since Emperor Kōkaku in 1817. Galileo is a global navigation satellite system (GNSS) built by the European Union (EU) and European Space Agency (ESA). The €5 billion project is named after the Italian astronomer Galileo Galilei. One of the aims of Galileo is to provide a high-precision positioning system upon which European nations can rely, independently from the Russian GLONASS, American GPS, and Chinese Compass systems, which can be disabled in times of war or political conflict. In addition to basic navigation services free of charge (giving horizontal and vertical measurements accurate to within 1 metre), Galileo provides a unique global Search and Rescue (SAR) function. Satellites can relay distress signals from a user's transmitter to the Rescue Coordination Centre, which then initiates a rescue operation. At the same time, the system provides a signal to the user, informing them that their situation has been detected and that help is on the way. This latter feature is a major upgrade compared to the existing GPS and GLONASS systems, which do not provide feedback to the user. The use of basic (low-precision) Galileo services is free and open to everyone. High-precision capabilities are available for paying commercial users and for military use. Many of the world's cars are already linked to the Internet in some way. By 2019, another layer of technology is being added in the form of wireless connections between vehicles. * Using a combination of Wi-Fi and GPS signals, they are now able to alert drivers to potential hazards or obstructions. For example, if a car two vehicles ahead of the driver brakes, but the car immediately in front does not, this technology warns him/her with a loud beep and flashing red lights on the windshield to hit the brakes. By communicating with each other and the roadway infrastructure, cars now have greatly improved safety, while traffic congestion and carbon emissions are reduced. In fact, the system is so effective that in some countries, accident fatalities drop by 80%. * It soon becomes mandatory, due to the obvious economic and safety benefits. This technology had already begun to appear on trucks, a few years earlier. Now passenger cars are using it too. Autonomous rapid transit has already been in place at certain airports and on city metro systems. 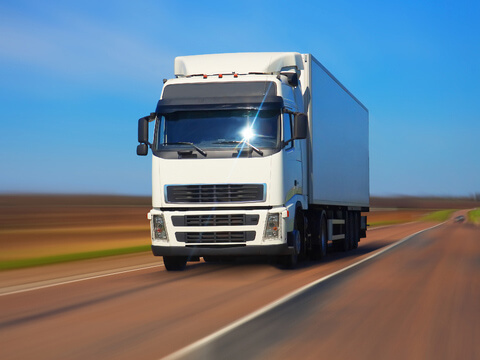 By 2019, it has begun spreading to public roads, with significant numbers of driverless trucks appearing. * These are capable of travelling hundreds of miles on their own, negotiating traffic and obstacles using advanced GPS technologies. They have a number of advantages over human drivers – such as being able to operate for 24 hours a day without getting tired, never being absent, and not requiring a salary or training. The trucks can also detect mechanical or software faults. These automated vehicles eventually include cars, taxis and other types of road vehicles, which become increasingly widespread in the 2020s and 2030s. Light-emitting diode (LED) lamps are 20 times more efficient and over 100 times longer lasting than incandescent bulbs. LEDs were first demonstrated in the early 1960s, but were low-powered and only emitted light in the low, red frequencies of the spectrum. For many years, they were used as indicators such as red standby dots on TVs. The first high-brightness blue LED was achieved in 1994 (an invention that earned the researchers a Nobel Prize in October 2014*). 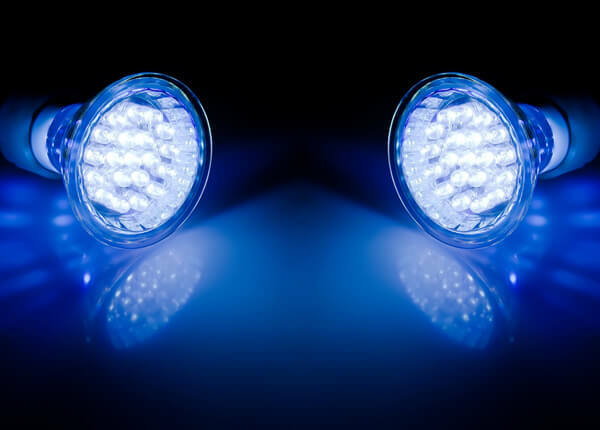 The existence of blue LEDs and high-efficiency LEDs quickly led to the development of the first white LED, which employed a phosphor coating to mix down-converted yellow light with blue to produce light that appeared white. As the technology developed further and the lamps became brighter, LEDs found new roles in a wide range of home, business and other applications. 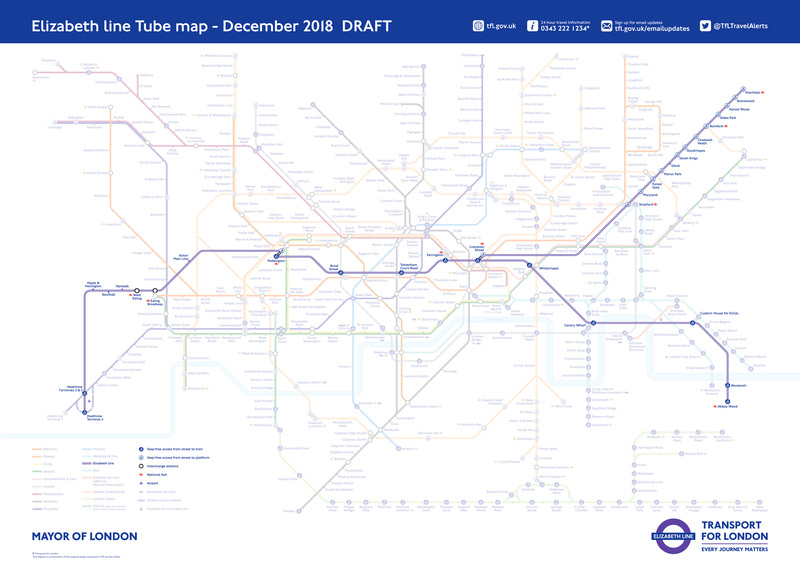 Crossrail is a major new rail line built for London and southeast England. In development since 1974, it is one of Europe's largest ever transport projects – designed to boost London's subway capacity by over 10% and bringing widespread regenerative benefits. The line has a total length of 118 km (73 miles), which includes 42 km (26 miles) of tunnels. It runs from the county of Berkshire in the west, through to Essex in the east, linking together all the main economic hubs in the UK capital: Heathrow Airport, the West End, the City of London and Canary Wharf. Nine-coach trains – each 200 metres (660 ft) long and carrying up to 1,500 people – run at frequencies of 24 per hour at peak periods. These brand new, longer trains feature walk-through air-conditioned carriages, live travel information and free Wi-Fi. The original planned schedule was for the first trains to run during 2017. A Comprehensive Spending Review in 2010 – saving over £1bn of the estimated £16bn projected costs – meant that the first trains to run on the central section would be delayed until December 2018. This timeline was then further delayed until the Autumn of 2019. * Crossrail is also named as the Elizabeth Line in honour of Queen Elizabeth II. In addition to the rail line, the project includes ten new state-of-the-art stations. Between 2002 and 2015, ongoing studies confirmed that the remaining one-third was weakening rapidly. * By 2019, Larsen B has shared the same fate as its smaller brother Larsen A, collapsing completely. 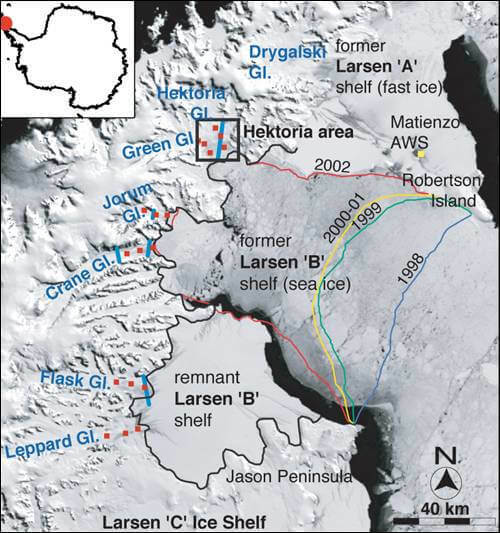 * This section had been stable for almost 12,000 years, essentially the entire Holocene period since the previous glacial period. In more recent times, warm currents had eaten away the underside of the shelf, creating a "hotspot". This had occurred in parallel with meltwater on the surface, forming ponds which flowed down into cracks and gradually levered the shelf apart. An even larger segment further south – Larsen C – has also been destabilising. This third and final ice shelf will collapse too, in the coming decades. ** Larsen C alone has the potential to raise sea levels by several centimetres, threatening coastal cities around the globe. 2 "Geologists say it will be nothing like the United States has ever seen." 3 "The Pacific Northwest has a long geological history of doing exactly what happened in Chile. There is an 80 percent chance the southern end of the fault off southern Oregon and Northern California could break in the next 50 years and produce a Megaquake." 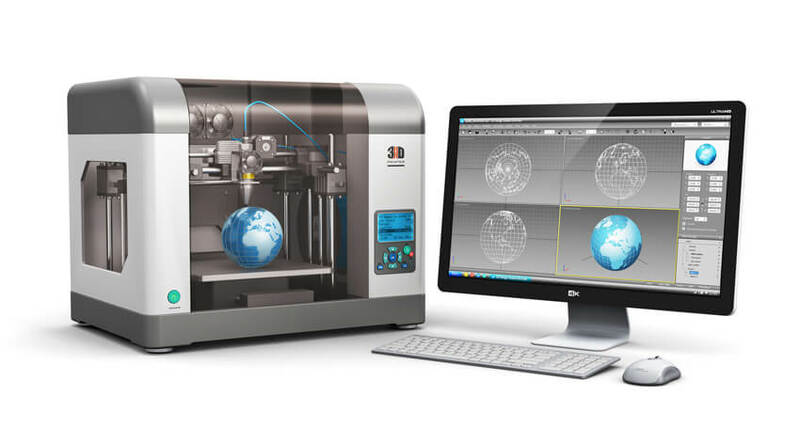 14 "Consumer 3D printing is around five to 10 years away from mainstream adoption." 27 "If the government makes a decision to go the regulation route, you could see this technology on vehicles by 2019 or 2020." 28 "The US DOT estimates that these technologies have the potential to reduce accident fatalities by a staggering 81 percent in all unimpaired driver related crashes." 40 "Cityringen consists of 17 new stations in central Copenhagen and will be completed in 2019." 42 "The Characterising Exoplanet Satellite, CHEOPS, will target 15 October to 14 November 2019 for launch." = net loss of -134 Gt.